After harvesting five more giant zucchini from the garden Matt pulled the plants this week. I have to say I'm not sorry to see them go, I'm running out of ways to use them! This dish was Matt's idea. He thought it would be a good way to use up the zucchini as well as two chorizo links we had in the fridge. It really came out quite good. 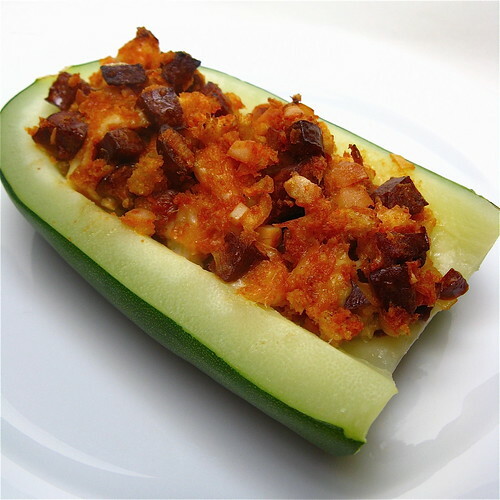 We loved the Spanish flavors of the filling & how well the zucchini worked with them. The chorizo we use is house made at our local grocery chain, Lund's. It has such wonderful spices & flavor that there is no need to add much more to this filling. We used a young Manchego but I think any mild white melting cheese would work as well. You really don't need anything else with this dish because it is so filling. Place the zucchini in a large pan cut side down & add water to cover as much as possible. Bring to a boil. Reduce to a simmer & let cook for about 5 minutes. Place zucchini in an oven safe dish. Heat the olive oil in a skillet over medium-high heat. Add the chorizo & onion & cook until the onion is almost translucent. Stir in tomato paste. Turn off heat & stir in the bread crumbs & cheese. Fill the zucchini with the stuffing. Bake for 35 - 45 minutes until the filling gets a nice crispy top. that sure is an interesting way to use zucchini. too bad i don't live close by you -- i'd take some of the zucchini off your hands any time. You guys deserve an award for your continual zucchini creativity. you could probably stuff a zucchini with anything and i'd love it, but i have to say, sausage would be a stand-out. good, good stuff. Yummy... I have some local chorizo I'll have to try this!! I am totally gaga for zucchini boats! You can put just about anything in them and they are awesome!! But I'm sure a zesty chorizo scramble would be extra awesome. THis looks really good. I have some zucchini in my gridge. hmm. I wonder if this would work with Mexican chorizo. I can't find Spanish chorizo anywhere here, but this sounds wonderful. Maybe it's time we pulled up our plant, too!